The Rattle Buggy is Baby Luigi's kart in Mario Kart: Double Dash!! 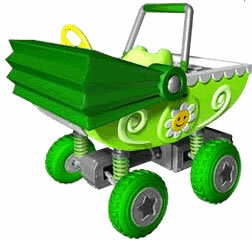 It is a lightweight kart and can be unlocked by completing the Mushroom Cup in 100cc. The Rattle Buggy features low speed, but has a high acceleration stat to back it up. This kart has the same weight as the Toad Kart. However, the Koopa Dasher (another lightweight kart with similar stats) is slightly heavier than the two. In terms of its actual stats, the Rattle Buggy's speed is tied with the Koopa Dasher and Boo Pipes. Its acceleration is also tied with that of the Goo-Goo Buggy, Toad Kart and Toadette Kart. Garagara kāto Garagara coming from the sound of a moving baby buggy. French Bibi Mobile Bibi Mobile, from bibi, a type of small hat for feminine wear, and automobile; possibly assonance on "bi" and a play on "bébé", French for "baby". This page was last edited on July 27, 2018, at 22:04.